The purpose of this study is to determine views of teachers’ on private courses and teachers’ efficacy, which would affect their views, were examined and the case was evaluated with regards to teachers. The study was conducted with the participation of 1065 teachers who work at different secondary schools in Ankara. When the data of the study was examined, it was determined that teachers’ views concerning private courses are positive. Teachers think that private courses have fewer numbers of students in one class where students are of the same level; they also think that private courses corroborate knowledge obtained at school so that lessons are learnt better. They think all these factors increase success. It was also determined that teachers’ efficacy is rather high. Moreover, it was seen that the more experience teachers have in their profession, the higher their perception of efficacy. Akın, F., Şimşek, O., & Erdem, T.(2007). Türkiye’de eğitim sorunu[Education problems in Turkey]. Available at http://www.turkegitimsen.org.tr/lib_yayin/82.pdf.Accessed 06 July 2015. Arabacı, İ. B., & Namlı, A. (2014). Dershanelerin kapatılması sürecinin yönetici, öğretmen ve öğrenci görüşlerine göre değerlendirilmesi [The assesment of the shutdown of preparatory schools process from the administrators, teachers and student’s perspectives]. Turkish Studies - International Periodical for the Languages, Literature and History of Turkish or Turkic, 9(11), 31-48. Ayvacı, H.S. & Er Nas, S. (2009). Fen ve Teknoloji dersi konularının okulda ve dershanede işlenişiyle ilgili durumların belirlenmesi [Determining the Processive Cases of Science and Technology Course Subjects at Schools and Private Preparation Course] . Dicle Üniversitesi Ziya Gökalp Eğitim Fakültesi Dergisi [Dicle University Journal of Ziya Gokalp Faculty of Education], 13, 113-124. Baloğlu, N., & Karadağ, E. (2008). Öğretmen yetkinliğinin tarihsel gelişimi ve Ohio öğretmen yetkinlik ölçeği: Türk kültürüne uyarlama, dil geçerliği ve faktör yapısının incelenmesi [Teacher efficacy and Ohio teacher efficacy scale: adaptation for Turkish culture, language validity and examination of factor structure]. Kuram ve Uygulamada Eğitim Yönetimi [Educational Administration: Theory and Practice],56,571-606. Baran, N., & Altun, T. (2014). Role and importance of dershanes in our education system. Journal of Research in Education and Teaching, 3(2), 333-344. Baştürk, S.(2011). Üniversiteye giriş sınavına hazırlanma sürecinin öğrencilerin matematik öğrenmeleri üzerine olumsuz yansımaları [Negative reflections of preparation process to the university entrance exam on students’ mathematics learning]. Hacettepe Üniversitesi Eğitim Fakültesi Dergisi[Hacettepe University Journal of Education], 40,69-79. Bray, M. (1999). The shadow education system: Private tutoring and its implications for planners. Fundamentals Educational Planning (No: 61). Paris: UNESCO International Institute for Educational Planning. Bray, M., & Silova, I. (2006). “The Private Phenomenon: International Patterns and Perspectives”, In M Bray & I Silova (eds).Education in a Hidden Marketplace: Monitoring and Private Tutoring.Budapest: Education Support Program (ESP) of the Open Society Institute,31-32, Available at http://www.opensocietyfoundations.org/sites/default/files/hidden_20070216.pdf.Accessed 01 July 2015. Büyükköse, F. (2010). Dershane seçiminde etkili olan faktörlerin belirlenmesi [Determining the factors that are effective for choosing the courses]. İstanbul: İstanbul University Institute of Science, Unpublished Master's Thesis. Coşkun, G. (2005). Özel dershanelerin ortaöğretimde verimliliğe ve istihdama etkisi [The effect of privat courses on productivity and employment in high school education].Istanbul: Istanbul University, Institute of Social Sciences, Unpublished Master's Thesis. Çayır, M. (2014). Dershane öğrencilerinin algılarına göre dershane öğrencilerinin üniversite hazırlık sürecinde dershaneye gitme sebeplerinin incelenmesi: İstanbul ili örneği[According to cram school students' perceptions, the analysis of the causes of cram school students' attendance at cram schools in the process of preparation for university: Sample from Istanbul province]. Istanbul: Fatih University, Institute of Social Sciences, Unpublished Master's Thesis. Dağlı, S. (2006). Özel dershanelere öğrenci gönderen velilerin dershaneler hakkındaki görüş ve beklentileri-Kahramanmaraş örneği[The opinions and expectation of the parents who send their children to privite teaching institution- Kahramanmaraş sample]. Kahramanmaras:Sutcu Imam University, Unpublished Master's Thesis. Dawson, W. (2010). Private tutoring and mass schooling in East Asia: Reflections of inequality in Japan, South Korea, and Cambodia. Asia Pacific Education Review, 11(1), 14-24. Doğan, S. (2010). Özel dershanelerdeki matematik eğitiminin niteliği ve öğrenci yaklaşımlarının incelenmesi [Investigating the nature and impacts of mathematics education on cram schools students].Istanbul: Marmara University, Institute of Educational Sciences, Unpublished Master's Thesis. ERG (2013). Dershanelerin kapatılması eğitimde kaliteyi ve fırsat eşitliğini sağlarmı? [Provides the closure of private courses quality and equality of opportunity in education?] Eğitim Reformu Girişimi[Education Reform Initiative].Available at http://erg.sabanciuniv.edu/tr/node/982. Accessed 15 July 2015. Güllü, K., & Şahin, A. R. (2015). Öğrencilerin özel dershanelerin hizmet kalitesi değerlendirmeleri ve bir uygulama [Service quality evaluation of university private preparation coursesstudents and an implementation]. E-Journal of New World Sciences Academy, 10(2), 7-57. Kahraman, E. (2013). Farklı okul türlerinde ve dershanelerde görev yapan öğretmenlerin dershanelerin işlevleri ve gerekliliği hakkındaki görüşleri [Views of the teachers who are employed in different types of schools and cramschoolsabout the functions and requirements of cramschools], İstanbul: Yeditepe University Institute of Social Sciences, Unpublished Master's Thesis. Kösterelioğlu, İ., & Bayar, A. (2014). An assessment on recent issues of Turkish education system. The Journal of Academic Social Science Studies- International Journal of Social Science, 25(1), 177-187, Doinumber:http://dx.doi.org/10.9761/JASSS2279. Okur, M., & Dikici, R. (2004). Özel dershaneler ile devlet okullarının “kartezyen çarpım-analitik düzlem ve bağıntı” konularındaki bilgi ve becerileri kazandırma düzeylerinin değerlendirilmesi [The evaluation of the level of knowledge and the skills gained in the subjects of “Cartesian product-analytic plane and relation” in private courses and government schools]. Kastamonu Eğitim Dergisi[Kastamonu Education Journal],12(2), 417-426. Özgen, N. (2012). Öğretmen adaylarının erozyon konusuna yönelik genel akademik bilgi düzeylerinin incelenmesi: Gazi Üniversitesi örneği [To determine the general academic knowledge level of teacher candidates on erosion: Gazi University sample]. Dicle Üniversitesi Ziya Gökalp Eğitim Fakültesi Dergisi [Dicle University Journal of Ziya Gokalp Faculty of Education], 18, 82-105. Özmen, H. (2005). Ortaöğretim kurumlarının ve özel dershanelerin kimya öğretimine yönelik karşılaştırılması [Comparison of secondary education foundations and private education institutions according to chemistry teaching]. 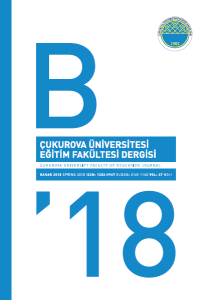 Ondokuz Mayıs Üniversitesi Eğitim Fakültesi Dergisi[Ondokuz Mayis University Journal of Faculty of Education],20, 26-38. Şahin, Ç. (2008). Yeni ilköğretim programı çerçevesinde sınıf öğretmenlerinin mesleki gelişim düzeylerinin değerlendirilmesi [The evaluation of the level of teachers professional development under the new primary education program]. Pamukkale Üniversitesi Eğitim Fakültesi Dergisi [Pamukkale UniversityJournal of Education], 24(2),101-112. Şirin, H. (2000). Eğitim sisteminde özel dershaneler [Private courses in education system]. Kuram ve Uygulamada Eğitim Yönetimi [Educational Administration: Theory and Practice], 23, 387-410. Temelli, A., Kurt, M.,& Köse, E. Ö.(2010). Özel dershanelerin biyoloji öğretimine katkılarının öğrenci görüşlerine göre değerlendirilmesi [Evaluation of the contributions of private courses in biology education, according to students’ opinions]. Kuramsal Eğitimbilim [Journal of Theoretical Educational Science],3(2),148-161. Tschannen-Moran, M., & Woolfolk-Hoy, A. (2001). Teacher efficacy: Capturing an elusive concept. Teaching and Teacher Education, 17,783-805. Tunay, U. (1992). Lise Öğrencilerini Özel Dershanelere İten Faktörler [Tending factors of high school students to the private courses]. Ankara: Ankara University, Master's Thesis. Turan, I. & Alaz, A. (2007). Özel dershanelerde coğrafya öğretiminin öğrenci görüşleri çerçevesinde değerlendirilmesi [The assessment of geography teaching on private courses according to the view of students]. Kastamonu Eğitim Dergisi[Kastamonu Education Journal], 15(1), 279–292. Umay, A. (2000). Matematik öğretiminde okul ve dershane eğitiminin karşılaştırılması[A comparison of school and private courses training in mathematics teaching]. Ankara: IV. Fen Bilimleri Eğitimi Kongresi [IV. Science Education Congress]. Varghese, N.V. (2006). Growth and expansion of private higher education in Africa. Paris: International Institute for Educational Planning. Yeşilyurt, S. (2008). Üniversiteye giriş sınavına hazırlanan öğrencilerin dershaneleri tercih etme sebepleri ve dershanelerdeki biyoloji öğretiminin durumu üzerine bir çalışma [A study on the reason why students being prepared to university entrance examination prefer the private courses named “dershane” and status of biology instruction at private courses]. Türk Fen Eğitimi Dergisi [Journal of Turkish Science Education], 2, 96-109. Yılmaz, K., & Altınkurt, Y. (2011). Prospective teachers’ views about the problems of Turkish educational system. International Journal of Human Sciences,8(1),941-973. Yiğit, N., & Akdeniz, A. R. (2001). Lise fen grubu öğrencilerinin özel dershanelere yönelme nedenleri [Causes of tending the high school science students to private courses]. Fen Bilimleri Eğitimi Sempozyumu [Science Education Symposium], Maltepe University, 7 - 8 Eylül 2001, İstanbul.